Blazer: Target // Jean shorts: Thrifted // Tights: Asos // sheer top: Old Navy // Calypte Collection Necklace: Etsy // Booties: Lulu’s Of course, I’ve been searching all summer for the perfect pair of light denim, high waisted, cut off shorts–ya I’m not picky at all. So I found them in November, go figure. I simply cannot wait until next May to bust these out, I had to find a way to make it work. This is not a complicated trick, just add tights under your shorts. I opted for a more sheer version because the shorts are rugged, so the outfit needed a sophisticated piece to pull it together. 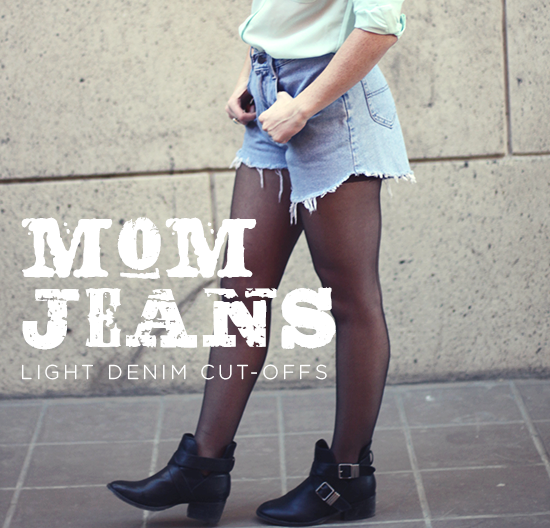 Mom jeans are usually a bad fashion move but when you wear them as cut offs you can get away with them. If you’re going to wear something high-waisted don’t wear a cropped a jacket. 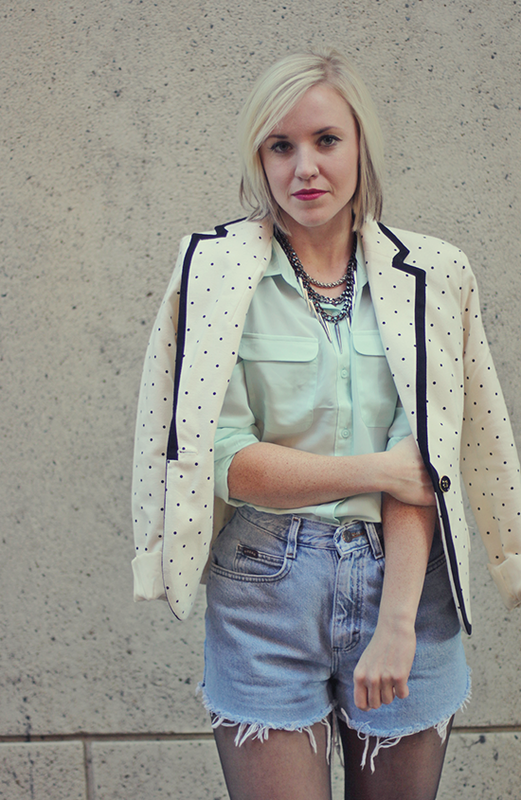 This blazer works because it hits lower than the hip and gives you body a proportionate scale. So it’s Black Friday and all—I’m not a huge fan of this day after working retail for like 7 years. So I hit a few online sales to avoid crazy crowds. I had a few things in mind that I hoping to find a good deal not day. 1. Warm pants for winter (corduroy or thick denim) 2. Casual kicks not for working just for romping around town. I was able to score both items on Black Friday sales. I ordered these cords from Anthropologie in 2 colors (-$20 from each) and these New Balance classic kicks (-$20). Did you guys score any good deals? Let me know in the comments below!